Home » brewing sake » brewery fresh sake on draft. cambridge brewing co.
brewery fresh sake on draft. cambridge brewing co. 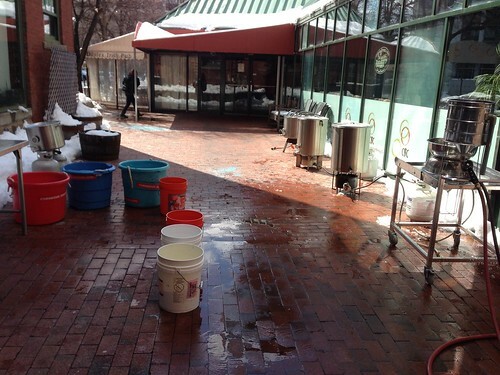 It feels like it was a long time ago when we were outside on the Cambridge Brewing Company patio with a slew of equipment and four twenty gallon kettles belching steam into the cold air. Our third annual batch of Sake at the CBC had begun. Most of this Sake was for our annual Sake/beer hybrid, Banryu-Ichi. 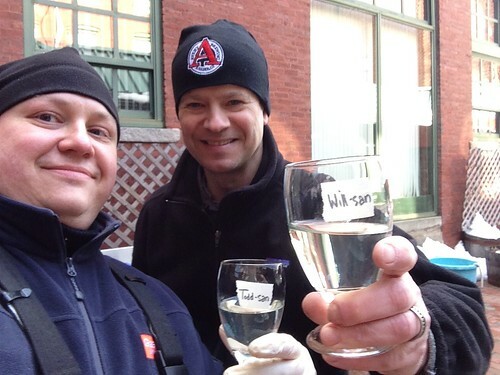 So why were Will Meyers and I freezing outside for days, while beer was being brewed in the warmth of the brewpub? Sake brews best in the cold, and, by the third day, it was clear that the microorganisms were running the show. Since we were using a 500-liter tank for our Sake batch, it seemed like a good idea to fill it. This would allow us to make a nice big batch of Banryu-Ichi, but also allow us to save some to drink unadulterated. This year we decided to try multiple yeast strains; something I hadn’t done before. I made two yeast starters (shubo) and allowed each yeast strain to develop on its own. This is not a new idea; you see this being done in Japan with great results, most notably the wonderfully complex Dassai brand Sake brewed by Asahi Shuzo. Our two yeasts are the most common in Japan: #7 and #9. Sake yeast #7 is a great fermenter with great basic flavors and dependability. Sake yeast #9 is known for amazing aromas and serves as the parentage for most Ginjo yeast strains. Using these two we achieved a robust fermentation with strong coconut and pineapple flavors and an expressive nose full of melon, strawberry, and cotton candy. While Banryu-Ichi was fermenting in a brewing tank, we filtered our reserved Sake. 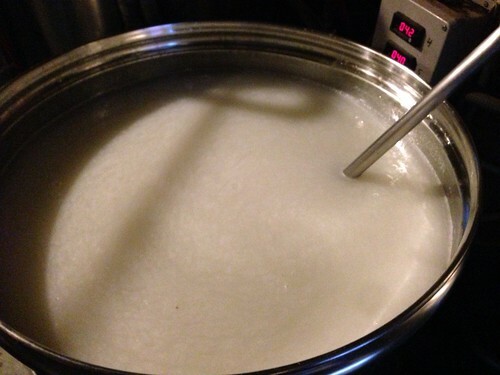 When Sake is done fermenting there remains a fair amount of solid material in the liquid: rice powder, yeast, and koji. Most commercial grade Sake is clarified by using a machine that presses the mash through filter screens resulting in clear Sake. 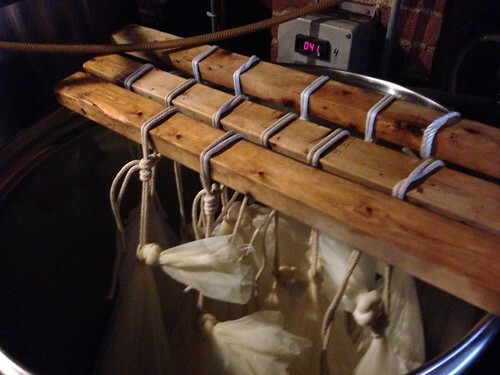 Competition Sake, however, is put in mesh bags and allowed to drip out under only the weight of the Sake – no added pressure is used. This creates an extremely soft and intricate Sake, but also results in lower yields. Since we don’t have any special Sake brewing equipment and want to make the highest quality of Sake possible, we opted for this more labor intensive method. Will Meyers and I have created something that is a rare opportunity outside of Japan: to try brewery fresh Sake. 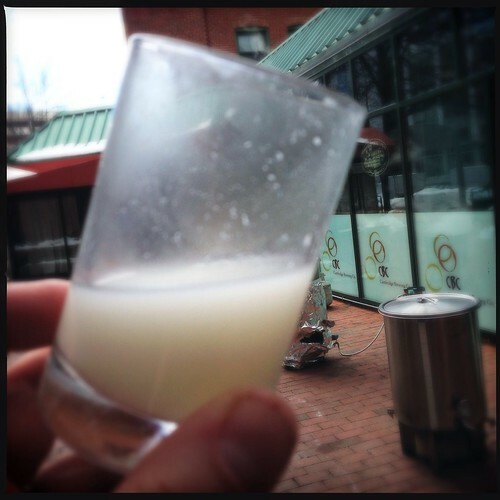 There are a handful of small, craft Sake breweries in the US, but here in Boston this is as close as you will get. 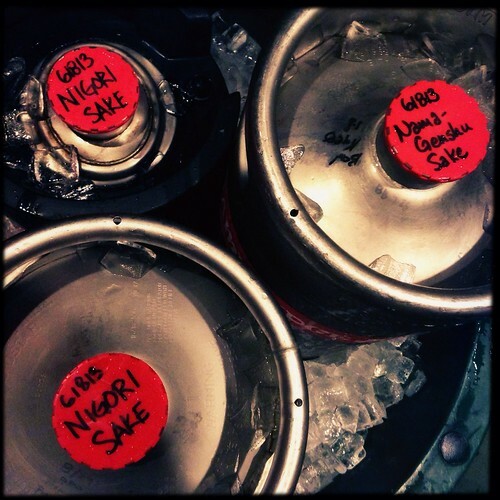 We have two different expressions of our Sake and, starting today with our Nigori Genshu (unfiltered, full-strength Sake), we will share them with the Boston area on draft at the CBC only. Stop by while the kegs last and taste Sake at its freshest. See what two friends can accomplish with some determination, fun, and cold brewing days outside on the patio! Me too…someday it’ll happen and the universe will utter a big sigh of relief.